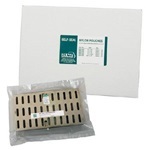 Dry heat self-seal sterilization pouches that are transparent in color. 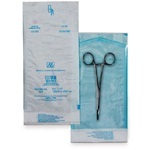 These self-sealing pouches are made from a nylon material and have dry-heat sterilization compatibility. Notched for ease of opening after processing, and complimentary external chemical indicator labels are included. Various sizes and brands of sterilization pouches. All pouches are transparent for easy viewing and are compatible for EO gas/steam sterilization.